Suggestion 2: Let them pick. Giving children a choice sometimes makes them feel more in control of the situation. Offer to make two different vegetables for dinner, let them have a say in which one will be served for dinner. Suggestion 3: Raw, Cooked, Frozen, Chopped, Blended, it doesn’t matter! Some kids prefer the texture and taste of raw vegetables. Try slices of raw orange or yellow peppers dipped into a sauce or dip. Suggestion 4: Rinse and Repeat! 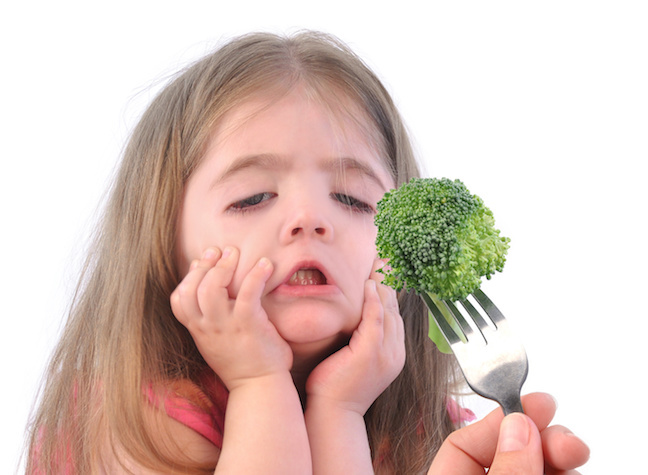 Many children will only eat 2-3 different vegetables. The key is exposure. 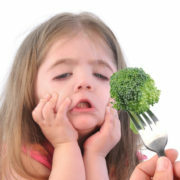 Continue to offer new vegetables, but know that it might take a long time before kids will accept them. Keep offering the ones they will eat, but also offer the ones they won’t eat, with no bribing or forcing to try them. Suggestion 5: Parents – Eat Your Veggies! Studies indicate the biggest predictor of how a child will eat as an adult is not how they currently eat, but how those around them ate when they were growing up. So, eat vegetables around your children and let them see you. Snack on raw or cooked vegetables, eat them for dinner and let your kids see them on your plate. Suggestion 6: Work with What You Got! My kids love Mexican food. This has been a good way for me to work on vegetables. I was able to add one color of pepper to our fajitas and even a few onions. For nacho night, I started by adding just a sprinkle of cilantro (an herb not a veggie, but it is green, so that was a big step), then salsa, and now fresh tomatoes. Progress! Do you have other ideas? Please feel free to share them here. We would love to hear from you! Diets: Keto, Paleo, Mediterranean, What’s a Kid to Do? Let’s Talk EdaMOMe!